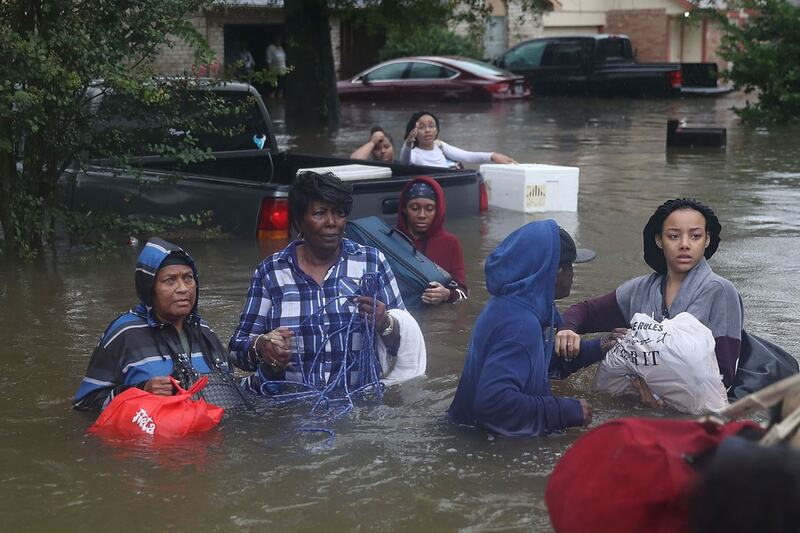 Thousands of residents have been rescued from their flooded homes in Texas, at least 30 people have died, and hundreds remain stranded as Tropical Storm Harvey continues to batter the region, making a second landfall in Louisiana. U of T News spoke with three experts about how Texas's poorly graded flood control infrastructure contributed to rising water levels, whether Louisiana addressed flooding issues after Katrina, public health concerns related to flooding and whether climate change has played a role in the storm. Jennifer Drake, an assistant professor of civil engineering who teaches at the Faculty of Applied Science & Engineering, says Texas's flood control infrastructure recently received a D grade. “Texas has known that its flood infrastructure needs improving for a long time,” she says. Jennifer Drake, an assistant professor who also teaches at the John H. Daniels Faculty of Architecture, Landscape, and Design. What if anything could have been done to avoid flooding at this scale? The flooding that is currently being experienced in Houston is historic and catastrophic in scale. An event of this scale is not preventable. For regional-scale flooding events like Hurricane Harvey, it is critical to have state-level floodplain management. Texas has known that its flood infrastructure needs improving for a long time. Some actions that could help prepare for extreme flooding are state-wide flood infrastructure planning, limiting and eliminating development within the floodplains, investing in early flood-warning systems and ultimately encouraging increased urban density over urban sprawl. Texas does not fund flood control infrastructure and its flood control infrastructure was graded D by the ASCE in 2012. Can stormwater management avoid flooding of this magnitude? Stormwater management typically refers to urban sewer infrastructure. This infrastructure is expected to flood during extreme events like Hurricane Harvey. Regional-level flooding is managed by big-infrastructure; this includes the natural and man-made watercourses, coastlines, floodplains, reservoirs and dams. An example of this kind of management is the U.S. Army Corps' decision to release water from Houston’s Addick and Barker reservoirs. This water is going to flood portions of the city downstream of the dams, but this is a preferable scenario. What can cities that are coastal towns do to prepare for extreme storms and flooding? The most important policy that coastal towns can do to prepare for extreme storms and flooding is to protect high-risk coastal areas and floodplains from urban development. By protecting this natural infrastructure we can eliminate a great deal of destruction. The second most important policy is to limit urban sprawl. Low density cities like Houston cover a massive area, which means that more people and public infrastructure is exposed. The vast amount of impervious surfaces that comes with low-density sprawl amplifies the impact of extreme weather by creating more flood water. Higher density communities with large undeveloped natural areas in key locations (e.g. floodplain) are more resilient and can sustain extreme weather with less destruction. The storm is now pounding through Louisiana. Can you talk about flood control infrastructure developments since Katrina. Will those help now, or is stormwater management still an issue there? There has been a large investment in infrastructure since Katrina. New Orleans has spent $14 billion on improvements to levees, flood walls, pumps and flood gates. However, many of the issues that led to the flooding after Katrina are still present today. Louisiana has lost a lot of its coastal wetlands, which can provide flood protection. New Orleans is still heavily reliant on structural protections like levees, which can fail, and there is still a great deal of development within floodplains. Arlene Sharon King is a former chief medical officer of Ontario and an adjunct professor at the Dalla Lana School of Public Health. In a disaster of this scale, what needs to happen to ensure it doesn't turn into a public health crisis? Immediate rescue efforts are important to prevent deaths and injuries when flooding occurs. Instructions from local emergency management officials need to be heeded, as they are most attuned to local circumstances. Residents need to listen to water advisories to ensure their water is safe to drink. They should collect all medications and medication records, including immunization records, and ensure that they remain dry by storing them in waterproof containers. If evacuation occurs due to flooding, residents should turn off utilities and gas connections. They should avoid driving through flooded areas and follow the instructions of local authorities, returning home only after authorities say it is safe. What diseases do we need to worry about related to flooding? Residents need to drink safe, clean water, such as bottled water or water that was collected before flooding occurred. Water- and food-borne illnesses can be spread by food or water contaminated by floodwaters. If in doubt, throw it out. Athena Masson is a PhD researcher in the department of physical and environmental sciences at U of T Scarborough, studying Atlantic-based hurricanes. How did the storm form? Hurricane Harvey is a unique and dangerous tropical cyclone on so many levels. It underwent a rapid intensification process while it was in the Gulf of Mexico, going from tropical storm status to Category 4 in a 24-hour period before making landfall near Rockport, Texas. Although the meteorological forecasts and models were very accurate in terms of direction and intensity change, Texans were given very little time to prepare for this system. The greatest threat with Harvey was not its Category 4 strength but its forward speed. Harvey was blocked by two high pressure systems to its north that were situated right over Texas. These high pressures acted as a blockade and slowed the storm down even before making landfall. This slow forward motion caused Harvey to reach Category 4 strength because of its extended time over the Gulf of Mexico, which allowed the storm to feed on the warm ocean waters. Harvey came ashore and moved very slowly which allowed for major hurricane force winds of over 210 km/hr to linger over the coast for an extended period of time. Once Harvey came ashore, the hurricane stalled right over the region, and even though it downgraded to a tropical storm, it began to bring historical levels of rain the likes of which we have never seen before. This system is still lingering over the region and is not expected to move out of the area until later this week. Harvey will not go down in history for its Category 4 strength or its intense winds. Instead, it will be known for its slow motion which produced feet of rain across southeast Texas and particularly in the Houston area. How does climate change play a role? Relating climate change to hurricane activity is a complicated topic due to the fact that there are so many components that go into a hurricane’s formation and its intensity. Researchers have identified that over the past 30 years, there has been an increase in hurricane activity with more cyclones forming in the Atlantic. It is important to note that the more hurricanes that are forming will increase the chances of the Atlantic producing more intense storms. Hurricanes form around this time of the year because the sea surface temperatures are prime for hurricane formation. One of several components a hurricane needs in order to form and strengthen are water temperatures of at least 26.5°C. The North Atlantic basin in recent years has been experiencing some hurricanes from outside of the designated Atlantic Hurricane Season (June 1 – Nov. 30). We will likely experience an increase in the frequency of hurricanes forming during the hurricane season, which can lead to a higher possibility of land-falling storms along Atlantic coastlines and therefore more devastation. Climate change has affected not only the atmospheric temperatures but also the ocean temperatures. Oceans are maintaining their high temperatures even outside of the designated hurricane season. Climate change will aid in altering the Atlantic Hurricane Season calendar where it will be the norm to experience hurricanes formed outside the designated time frame. The North Atlantic basin could become a year-round hurricane season (just like the Northwest Pacific basin) in the distant future if temperatures continue to increase worldwide.